Fresh off their latest European tour, the ska punk band returns home to Gainesville to host its 6th annual Wake N Bake Weekend at High Dive and other downtown venues. 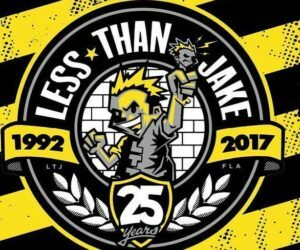 The 25th anniversary of Less Than Jake came and went this summer without much fanfare. The band was too busy doing what it’s always done best: playing music for its die-hard fans around the world. 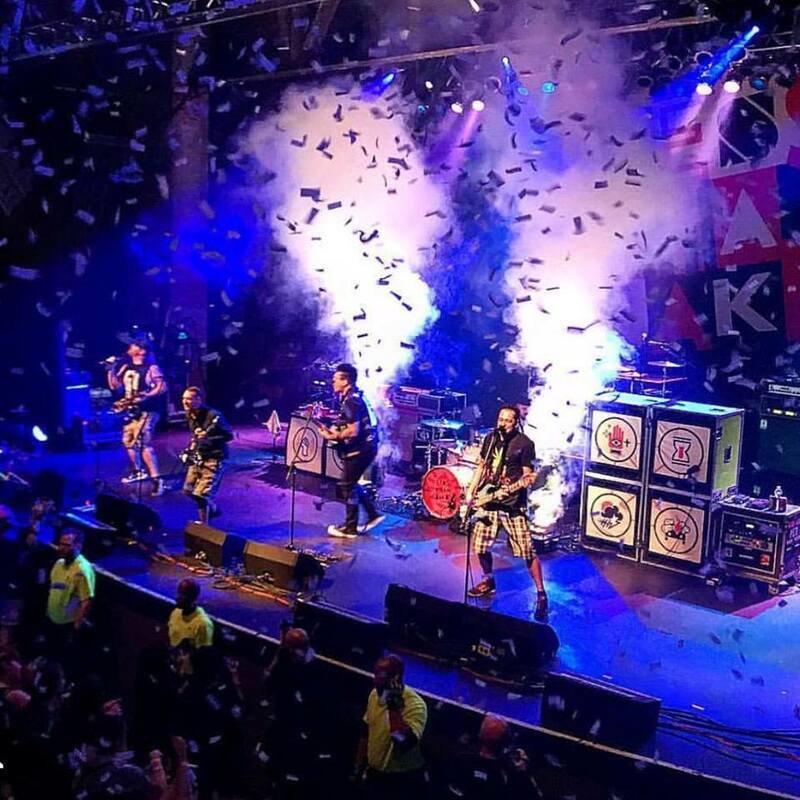 Less Than Jake spent the early part of August skipping across Europe, performing before enthusiastic crowds in Belgium, Slovenia, Austria, Italy, Hungary, the Czech Republic, Germany and the Netherlands. Now it’s Less Than Jake’s chance to return to its Gainesville roots for the sixth annual Wake N Bake Weekend based at High Dive. On Friday night, Less Than Jake headlines a show that also includes Radon, Savage Brewtality and The Mermers. On Saturday, Less Than Jake performs along with Inner Circle, Coffee Project and Propaganjah. A quarter-century after Less Than Jake’s inauspicious debut in downtown Gainesville, DeMakes still has fond memories of that mid-July day in 1992 at a venue on North Main Street now known as the Atlantic. 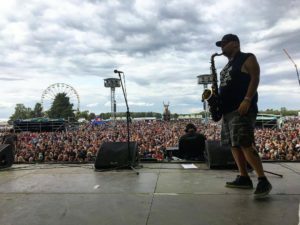 Less Than Jake saxophonist Peter “JR” Wasilewski is the band’s “rookie,” having joined in 2000. Within a year, the band released its first record, Smoke Spot. Its first album, Pezcore, was released in 1995. Now the band has eight studio albums to its credit. 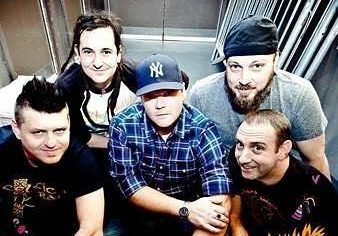 Early this year, Less Than Jake released a seven-song LP titled “Sound the Alarm.” The band expects to go back in the studio later this year or early 2018 to record a ninth album. To DeMakes, now 43, the past 25 years have flown by. “I can go year by year and tell you everything we did, but at the same time it’s like a blur,” he said. “It’s hard to explain. I still feel like I’m 18. It also feels like it’s gone by a lot quicker than what your mind tells you 25 years should be. Less Than Jake still tours like a band in their 20s, which is a source of pride for the band. 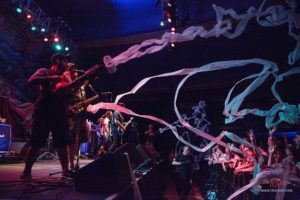 Less Than Jake always puts on a show for its fans. The Wake N Bake Weekend gives Less Than Jake an opportunity to return home, but not necessarily to rest. In addition to the two nights of concerts, the band is committed to VIP appearances Friday evening at Loosey’s and Saturday afternoon at the Heartwood Soundstage. There’s also a FEST Wrestling show at Eight Seconds on Sunday. Unlike many bands, Less Than Jake doesn’t mind getting to meet its fans up close and personal. And then there’s the music itself. When Less Than Jake takes the stage, the energy level skyrockets. Pat Lavery, who books concerts at High Dive through his Glory Days Presents, said Less Than Jake’s success is no accident. A commemorative cup for this year’s Wake N Bake Weekend. 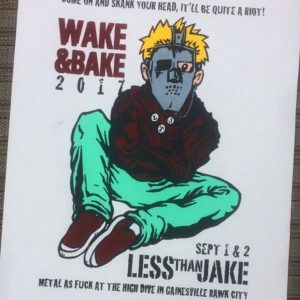 Lavery has been doing shows for Less Than Jake for a dozen years now, including all six Wake N Bake Weekends. He said they are easily one of the best bands to emerge from Gainesville’s vibrant music scene. “As far as popularity and success go, I think basically there is Tom Petty on one level and then there is the group of bands that came out of the ’90s and early 2000s: Less Than Jake, Hot Water Music, Against Me,” he said. “They are all on pretty equal footing, though HWM doesn’t tour much anymore. DeMakes said that Less Than Jake will do everything to please its most loyal fans this weekend. Less Than Jake would have it no other way. In return, High Dive pulls out all the stops, according to Lavery. 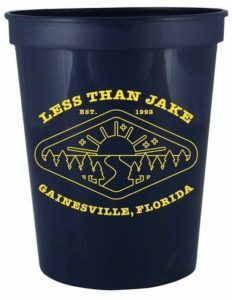 As a special touch, all drinks are served in special Wake N Bake Weekend commemorative cups that the band designs. Meanwhile, DeMakes is looking forward to the Wake N Bake Weekend — and beyond. For further info, visit the Less Than Jake website and the High Dive website.